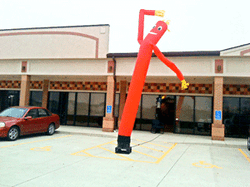 Promote your Business or Event with our 20 ft. Air Dancers! These are a cost effective way to grab attention!! We currently offer 3 colors with more on the way. Price: $35.00 per 5 / hrs.